IBM Db2 Warehouse uses BLU Acceleration, IBM’s in-memory columnar processing technology. Entire data sets and decompression are not needed in-memory and the offering performs pre-fetching of data and data skipping. IBM Netezza Analytics are built directly into IBM Db2 Warehouse, with multiple algorithms, including linear regression, decision tree clustering, k-means clustering and ESRI-compatible geospatial extensions. IBM Db2 Warehouse combined with Spark offers higher performance than standalone Spark, providing a better data science experience for data exploration and to train and evaluate predictive models interactively. IBM Db2 Warehouse includes integrated RStudio for development and R in-database functions, operating directly on data in a database. A web console can be used to load data and perform analytics within minutes. IBM makes cloud database migration easy, as IBM Db2 Warehouse works with supported Db2 drivers, and is compatible with Db2, PDA, and Oracle. 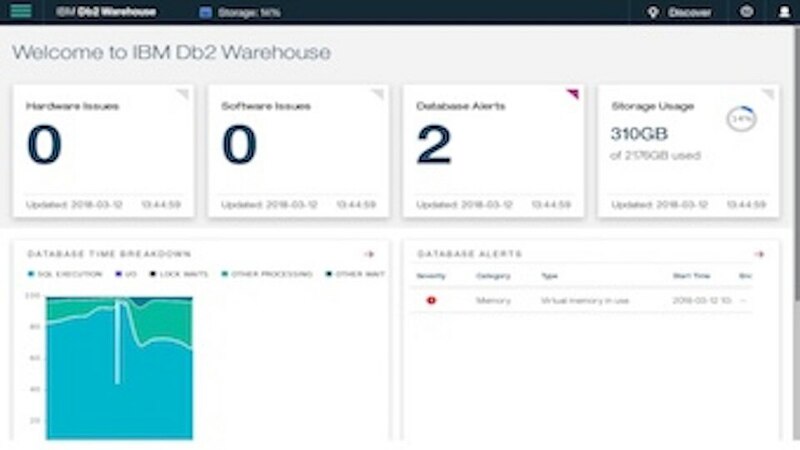 Deploy IBM Db2 Warehouse as a standalone cloud data warehouse or integrate with on-premises data warehouse for a hybrid solution. For example, Db2 Warehouse can federate queries to on-premises data warehouses using built in Fluid Query, removing the need for ETL processes. With IBM Db2 Warehouse, each node contains its own data and is overlaid with a local Apache Spark executor process, minimizing the latency of accessing the data and speeding up calculations 3 to 5 times faster than in a standalone Spark cluster. A Jupyter notebook container is included with the container to execute interactive code entered in the notebook, with one-click-deployment in which the code is transformed into a compiled and deployed Spark application inside Db2 Warehouse. IBM Db2 Warehouse can be deployed on any Docker supporting operating system of choice- X86, Windows, Mac or Power HW. By taking advantage of SDE, Db2 Warehouse can auto-provision resources to handle changing workload needs. SDE makes deployment and management more efficient, with elastic scaling and ease of updates and upgrades. For example, Db2 Warehouse can provision a full data warehouse stack, including Spark, in minutes. IBM Hybrid Data Management Platform allows you to leverage all available data, no matter the type, source or structure. Simply purchase IBM FlexPoints and allocate towards multiple resources with a single, subscription-based license. There has been an interest in hybrid data warehousing. Learn how the flexibility of a hybrid data warehouse enables IT to gain back control of the data, and enable users to gain self service access to all relevant data sources. Real life customer case studies will also be discussed. Db2 Warehouse provides easy way to Scale out and Scale back in to match their workload demands. It will help save on licensing costs as they pay for what they use on a monthly basis.